The early leaf fans bear attractive yellow and green striped variegation, but this deepens to green as the plant matures. 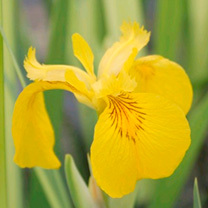 The yellow flowers have distinct brown markings. Flowers June and July. Height 50-100cm. Medium growing. Depth 15cm. PLEASE NOTE: Harmful if eaten. Supplied in a 1 litre pot.